To kick off our festive season, this week the CPAC is launching a new fundraiser. 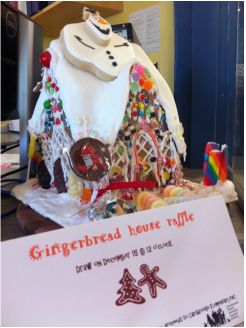 an Amazing gingerbread house with a "Frozen theme" will be on view outside the front office from Monday onwards. Proceeds from the sale of the raffle tickets for both houses will go to Carisbrooke PAC. 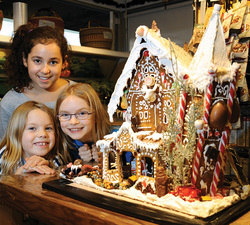 Not only do you get a chance to win the Frozen Gingerbread house (as a Carisbrooke Parent) you are also automatically entered to win another gingerbead house (tickets are open to the community) which can be seen at Sprout Organic Market, 700 East 7th St. North Van (in Queensbury Village as the foot of Grand Boulevard) which will have a "Winter Wonderland" theme. The draw for this house is on Sunday the 21st. The draw for this house is on Monday the 15th. The Gotcha Draw house was won by Hudson G as part of a two week special gotcha draw on Friday the 12th.